Last night we had one of the most intense storms I've ever been through in Seattle. It's being compared to the Inaugural Day Storm of of 1993. The winds reached gusts of 90 mph (145 km/h). I was in Hurricane/Tropical Storm Isidore in New Orleans in September 2002. (This was the last major storm to hit New Orleans before Hurricane Katrina leveled the city.) What I heard and saw outside in Seattle last night was comparable to that storm. It started yesterday, Thursday, around 4:00 with pounding rain and wind. Within an hour, major roads had turned into lakes. So, I jetted out of the office and took the backroads through Bellevue. By 5:30, I was calling neighbors and friends to pick up our kids. Brenda and I weren't going to make it. By the time we watched the news, we saw more pictures of lakes where roads and neighborhoods should have been. At 8:00 a.m., our neighbor was ringing the doorbell. Evidently, we lost a bunch of shingles. 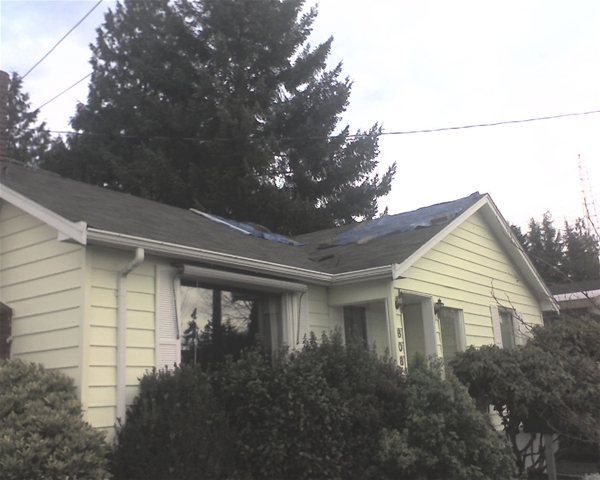 Fortunately, this neighbor helped put a tarp up. Brenda got on the phone and called our insurance company and roofing companies. As you can imagine, there's quite a wait for roofing companies, so we're hoping we don't see rain approaching the level we saw last night. So, at least 1 million people were without power this morning (we lost power last night, but it was back on by 8:00 a.m.). Many businesses are still without power, and the 520 bridge is closed due to some damage incurred by the storm. 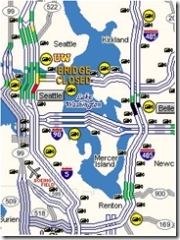 WSDOT map from around 11:00 a.m. 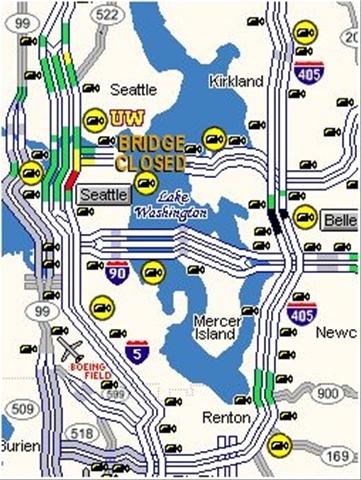 I don't think I've ever seen the "Bridge Closed" graphic before. Right now it's party cloudy and not raining outside. I'm hoping that the weather stays relatively calm for a few days.